For those who are interested, there is work in the 3.5 stream to make the Eclipse help system pluggable (again!). I’ve come across quite a few people that have had use cases to use something other than Jetty so please comment if you do! There’s also talk about moving the Help System to Lucene 2.4, if you have a vested interest in this for some reason, please comment here. There’s still some polishing to do, but it all should be good before the 3.4M5 release date. Don’t know what help contexts are? Well that’s a shame, they are the magic behind the ‘context-sensitiveness’ of the Eclipse help system. If you’re writing some tooling or an RCP-based application that includes help, I highly recommend writing contexts to assist your end-users. Many thanks to Curtis Windatt of Debug fame who got this contribution off the ground in time before feature freeze. …Eclipse Help is nonetheless extremely interesting as a case study of how a fully-featured Help system can be delivered, and could be used as a model or benchmark for cross-platform Help. 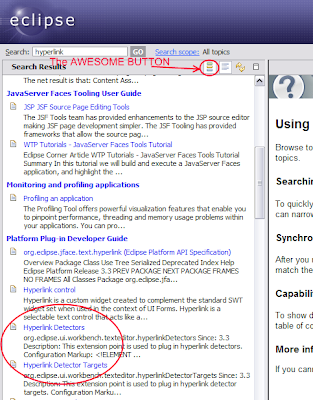 A feature was finally created for adding Help to your Eclipse RCP applications. The feature will make its debut in 3.4M5. This should simplify the process of working with the help system as in the past, it was a bit painful playing the ‘which plug-in do I need to run the help system’ game. 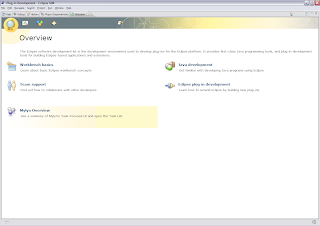 The ability to run the Eclipse Help System on different servers will becoming a reality in the 3.4 version of Eclipse. I’ve heard this request quite a few times from various people so it’s nice to finally get this taken care of. It looks like people have managed to get the help system running on WAS, WAS CE and Tomcat so far. To stay informed, cc yourself on this bug. Can you see what’s wrong with this picture? Most people can’t. Only a few people like Kevin McGuire who like to nitpick and subscribe to the religion of color can spot the problem quickly. I call these people pixel pushers. In my opinion, these are the people that make Eclipse look good due to their attention to detail. Oh my eyes! When I saw this it hit me like a ton of bricks and I had to fix it immediately. Why does this happen? Well, there’s the unfortunate situation when Eclipse Forms sections are given text clients with things like toolbar managers to add cool icons. This results in text clients taller than their title text so things grow accordingly causing adjacent sections to possibly not align. If you would like to learn more about this problem, check out this unpublished article on some new things in Eclipse Forms 3.3 by one of my favorite people in Toronto, Adam Archer. Does this make me a pixel pusher too? Suggestions for the Eclipse Welcome Experience? The Eclipse User Assistance (UA) team is looking for suggestions on how to improve the Welcome experience for the 3.4 version of Eclipse. I opened a bug to help facilitate the discussion. If you ever had a problem with the Welcome experience within Eclipse, here’s your chance to be heard and have your thoughts considered for the 3.4 release. My favorite IBM new hire Adam Archer and user assistance guru Chris Goldthorpe have a new article out on Eclipse Corner. It’s entitled, Adding Help Support to a Rich Client Platform (RCP) Application and is full of goodies like adding context-related help to your RCP applications. If you ever were in a situation that you needed to get Eclipse’s standalone Help working for a client or your company, you probably felt the pain of trying to figure out what the minimum dependencies were. This is even tricker in 3.3 now due to the Jetty move. If you support creating a feature just for Help, voice your opinions on this feature request.